This completely renovated executive villa has stunning views and is situated in a desirable residential suburb within walking distance to the CBD (Central Business District). 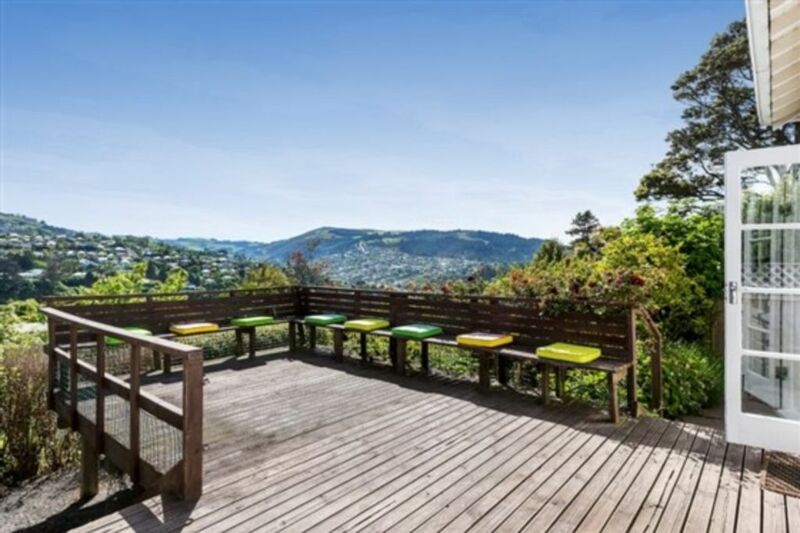 It is also close to restaurants, cafes, Moana Pool, Balmacewan Golf Course, University of Otago, Dunedin Public Hospital, Mercy Private Hospital and the Forsyth Barr Stadium. A bus stop is conveniently outside your front door. The house is also a few minutes away from the top 3 prestigious private schools in Dunedin: Columba College, John McGlashan and St Hilda’s College. This newly renovated and luxurious getaway, with French doors leading to a large deck and beautiful garden as well as shining rays of sunlight it is the perfect place to be comfortable and relax. This villa comes fully equipped with FREE WIFI as well as being extremely comfortable and with all modern conveniences (including an up to date kitchen with premium appliances. Dec to Feb rate: $155/night for 3 night minimum( weekend$165), $165/night for 2 night minimum. Rest of Year rate: $145/ night for 2 night minimum( weekend is$155), one night rate is $300/ night for4 people(Weekend $350/night for 4 people. Please note that for the occasional major event i.e. international concerts and rugby matches the minimum nightly special rate . If you cancelled the booking on this special day, the deposits not refund. Long term discounts available for stays over 30 days - please enquire at time of booking, or text 0064-27-5037288". if you have move 6 people, please contact Amy. if you have two people, need two bedroom, we will charge 3people rent fee. also we provide (offer) Dunedin tour services, the fee discuss. Thank you Amy. The house was immaculate upon arrival. It was great that you were there to show us all the amenities personally. The home appears small from the street but is huge inside and the internet photos don't do the lovely decor (very suited to the style of the home) enough justice. We were pleasantly surprised how spacious the bedrooms were with a huge amount of cupboard space. The master bedroom has a stunning full length vintage mirror which is perfect for a bride to stand in front of and be photographed. 2 toilets were also a plus. The kitchen is great with everything you need. The deck and views over Dunedin gave it a lovely vista. The best quality to this home however, is it's close drive to both George street and the botanical gardens. You feel miles away from everything while inside, but hop in the car and you're 3-5 minutes, close to everything. A really fantastic location for our Wedding weekend in Dunedin. Well appointed, tidy and very comfortable property. Amy was very friendly and welcoming. Property was exactly as described and beautiful. Beds were very comfortable, rooms were spacious. Thoroughly enjoyed our stay. Laura. Thank you very much for coming. Thanks for the feedback, I hope you have enjoyed your stay in Dunedin. Look forward to have you back with us in the future! Very good location, beautiful and clean house, a nice owner. Thanks! Thank you for your great review. I am very glad you enjoyed your stay. Hopefully see you again. Lovely character home, great view. Beautiful 1920s villa with original features- panelling, ornate plaster ceilings, stained glass and decorative leadlight windows typical of the era. Modern kitchen and bathroom with great shower though! Was great to stay in such a historic house. Convenient to town - do be aware it is up a steep hill though - hence the views. We drove in - 5 mins. Nice area too. Lovely landlady had it all well set up. Kathrine's family is great guests. Communication was easy and they left the house very neat and tidy. I would highly recommend her to her family to future holiday house hosts. Great guests. They are very good look after my house, Thank you very much for your feedback, you welcome back.